Double-decker trains, to cut journeys between London and Birmingham to 45 minutes, are being considered. The Department for Transport is looking at plans for a new 190mph (305km/h) link from near the new Channel Tunnel terminus in London to the Midlands. Costing £15bn, the link would enable Midlands travellers to reach Paris in three hours, bypassing central London. The BBC's Midlands Transport Correspondent, Peter Plisner, said raising the money would not be easy. He said the initial cost would inevitably escalate to billions of pounds more. 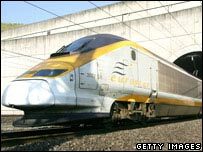 He added: "After initial disappointment when Eurostar was launched that Midlanders could not go direct to the continent on the train, this plan could finally allow this to happen." The line would have the opportunity to extend at each end - to Heathrow, via a five-mile tunnel, and to Manchester. The plan was first envisaged by Greengauge 21, a group of rail industry leaders, and is being looked at in Whitehall. It is estimated the new line would take at least 15 years to complete. A spokesperson for the Department for Transport confirmed the scheme was among those being considered but added that £8bn was being spent on the west coast main line upgrade, which would be completed next year. "That will set the standard on that line to 2020," he said. "We are not ruling out any projects at present, but we will be making a major announcement about the future of railway services next month," he said. "Until then we cannot comment any further."